Purchased 1895 in Italy by Max Chabrières-Arlès, Lyon. Clarence H. Mackay [1874-1938], Roslyn, New York, by 1926; his estate; sold through (Jacques Seligmann and Co., New York) to (Duveen Brothers, Inc., London, New York, and Paris); purchased 1939 by the Samuel H. Kress Foundation, New York; gift 1943 to NGA. Published in The Clarence H. Mackay Collection, New York, 1926: pl. 18. See Mackay files in Seligmann papers, Archives of American Art, boxes 238-239 (copies in NGA curatorial files). Exposition d'Objets d'Art du Moyen Age et de la Renaissance, Hotel de Sagan, Paris, 1913, unnumbered catalogue, pl. VII. 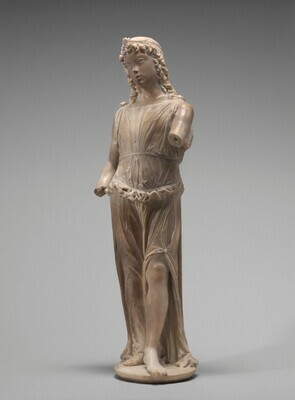 Tullio Lombardo and Venetian High Renaissance Sculpture, National Gallery of Art, Washington, D.C., 2009, no. 9, repro. Valentiner, W.R. The Clarence H. Mackay Collection. New York, 1926: no. 18, as by Pietro Lombardo, repro. Preliminary Catalogue of Paintings and Sculpture. National Gallery of Art, Washington, 1941: 227, no. A-47, as A Singing Angel. Book of Illustrations. National Gallery of Art, Washington, 1942: 254, repro. 230, as A Singing Angel. Duveen Brothers, Inc. Duveen Sculpture in Public Collections of America: A Catalog Raisonné with illustrations of Italian Renaissance Sculptures by the Great Masters which have passed through the House of Duveen. New York, 1944: figs. 151-153, as Singing Angel. Paintings and Sculpture from the Kress Collection. National Gallery of Art, Washington, 1945 (reprinted 1947, 1949): 194, repro., as A Singing Angel. Seymour, Charles. Masterpieces of Sculpture from the National Gallery of Art. Washington and New York, 1949: 180, note 40, repro. 124-126, as A Singing Angel. Paintings and Sculpture from the Samuel H. Kress Collection. National Gallery of Art, Washington, 1959: 414, repro., as A Singing Angel. Walker, John, Guy Emerson, and Charles Seymour. Art Treasures for America: An Anthology of Paintings & Sculpture in the Samuel H. Kress Collection. London, 1961: 56, repro. pl. 49. Summary Catalogue of European Paintings and Sculpture. National Gallery of Art, Washington, 1965: 161, as A Singing Angel. European Paintings and Sculpture, Illustrations. National Gallery of Art, Washington, 1968: 142, repro., as A Singing Angel. Middeldorf, Ulrich. Sculptures from the Samuel H. Kress Collection: European Schools XIV-XIX Century. London, 1976: 57. Walker, John. National Gallery of Art, Washington. Rev. ed. New York, 1984: 632, no. 989, repro., as A Singing Angel. Sculpture: An Illustrated Catalogue. National Gallery of Art, Washington, 1994: 138, repro.